Patrick Harbin, 20, is charged with aggravated vehicular hijacking after allegedly sticking a gun in a man's face and ordering him out of his car. COOK COUNTY CRIMINAL COURTHOUSE — A man was carjacked in the River North neighborhood in the early morning as he sat in his running 2013 Chrysler 300. Patrick Harbin, of the 6600 block of South Perry Street, allegedly appeared in the driver's open window in the 400 block of West Huron Street at about 2 a.m. Sept. 9, pointed a gun at him and said, "Get the f--- out of the car." 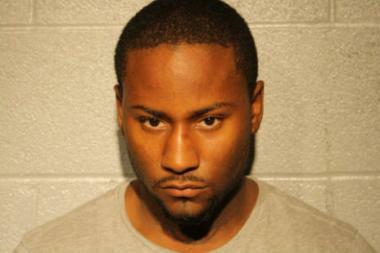 The driver tried to stuff his cell phone in his pocket, but Harbin allegedly took it, too, prosecutors said. Once outside the car, the driver ran away even as Harbin ordered him to come back. Harbin, 20, was arrested a week later, on Monday at his home in possession of the car, according to court records. Among Harbin's many tattoos — the Chicago Bulls and Bears logos and "Sox" spelled out — are a happy face with the words, "Win Some," and a sad face with the words "Lose Some." On Wednesday, when the alleged carjacker appeared in court for a bond hearing, he struggled with sheriffs deputies. They wrestled Harbin back into the lockup at the Cook County Criminal Courthouse after Maria Kuriakos Ciesil ordered him held on $250,000 bond.